A ‘man overboard’ situation is a very common occurrence on the water, but whether it leads to a simple rescue or a terrifying emergency is down to the knowledge and actions of the crew. Man overboard is one of the most common boating emergencies. Anyone planning to spend a significant time on the water should therefore be aware of what to do if it occurs. Of course a man overboard situation is not always a serious emergency; falling from a yacht into calm clear blue waters on a Mediterranean shoreline could even be classed as being part of the fun. But there are many more instances – when the weather and water are less hospitable, and when the person overboard is not a strong swimmer – when it is, and when only fast and appropriate action can stop it escalating into a tragedy. If somebody does suffer the misfortune of falling overboard then the immediate first response should be to shout ‘man overboard’ to alert everyone onboard of the emergency situation and reassure the victim that a rescue operation is underway. The next moves should be to identify and record the location of the victim and to cut off the vessel’s power. If there is more than one person in the crew then one member’s job should be to take over responsibility for watching over the victim, and keeping the helmsperson informed as to their exact location. GPS could also be used as more reliable way of recording the location of the victim. This role is particularly vital on a sailboat where it is not as easy to halt the progress of the vessel as it is with a motor boat. To stop a sailboat’s forward motion it should be turned into the wind or the sails should be lowered. At night time the victim will prove much harder to spot and so a white parachute flare can be used to illuminate the area. This bright light will pick out the reflective tape on the life jacket or any clothing. The overboard victim should then be thrown a floatation device. When doing this it is essential to establish whether there is a wind or a current and which direction they are in. The floatation device should be then be tossed on the person’s upwind or up current side to enable it to drift down to them. Manoeuvring the vessel to recover the person overboard is relatively straightforward in a motor boat less so in a sailboat. With shallow-draft boats that tend to ‘kite’ or blow sideways in the wind, it is usually best to arrive at the floating person from downwind as coming upwind may lead to the boat being blown past them. Keeled sailboats are not buffeted by the wind so much, and so can come in from upwind, before shutting off their motor and drifting close enough to throw a line to the person. 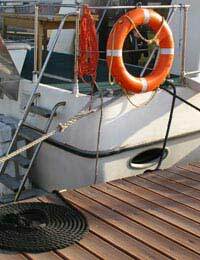 The person should be helped back onboard with the aid of a swim ladder. If the person is heavily waterlogged, injured, elderly or all three, then they will likely need help getting back aboard. Two or three crew members should pull on both arms and on the back of the personal floatation device (PFD). Being the actual person overboard is an often frightening experience, particularly if the crew of the vessel are not well versed in the procedure outlined above and even worse if nobody noticed the fall overboard. It is being in such a situation when having the common sense to wear a PFD will come as an immense relief. Those wearing a PFD can concentrate on conserving body heat and making every effort to be noticed and rescued, whilst those without will be distracted by their efforts to keep afloat. Being the ‘man overboard’ is a very helpless and vulnerable position to be in, because they are almost entirely reliant on the efforts of others to rescue them. The role of the man overboard is to survive for as long as they can. If wearing a PFD the main efforts to aid survival should be to try to maintain body heat. For instance the Heat Escape Lessening Position (H.E.L.P) should be used to conserve heat. This is when a person holds their knees up to their chests. The head should be kept out of the water if possible, as immersing the face will cause the body to lose heat rapidly. It is also not wise to take off any clothes in order to swim better unless they completely restrict movement, because even wet clothes conserve heat.